The Carmike six-screen theater on 29N is closing down, Graelyn Brashear reports for C-Ville Weekly. It became a $1.50 second-run theater a year ago, but that only stalled its demise briefly. That leaves Charlottesville an all-Regal town, with their six-screen theater on the Downtown Mall and their fourteen-screen theater in the Stonefield development. In a 4-1 vote, City Council denied Black Market Moto Saloon a music permit at tonight’s meeting, Graham Moomaw writes for the Daily Progress. Owner Matteus Frankovich held live music performances at the Meade & Market restaurant for the first few months of its existence, until complaints of loud, late-night music caused the performances to come to the attention of the city, who pointed out that Frankovich had no permit to hold concerts. The owner applied to the Planning Commission for a special-use permit, who recommended a narrowly tailored permit, but City Council disagreed, presumably influenced in part by neighbors turning out and asking that it be denied. Some members of Council saw the period in which the venue was operating illegally as a good enough test run to find that it would be incompatible with the neighborhood. (Moto Saloon may not be thrilled with the April Foursquare tip that “if it gets too loud the bartender has earplugs.”) Frankovich says that his business’s success is contingent on the ability to host live music, and while he doesn’t intend to take the matter to court, he has threatened (jokingly, one assumes) to open a “nudie bar” instead. 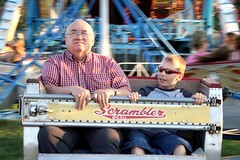 The Albemarle County Fair will return this year, Hawes Spencer writes in The Hook. It will be held at Ash Lawn, temporarily, as they continue to seek out a permanent location. 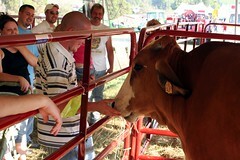 Ash Lawn not being an ideal venue, the 2012 fair will be brought back to its agricultural roots—just three days long, daylight hours only, focusing on livestock, contests, and entertainment, with no rides and less vendors. Organizers of the event had to cancel the annual event last year, since their long-time borrowed location of Bundoran Farm had been turned into a vineyard. (A small, brief, purely agricultural event was held at a private farm, so that all the 4-H kids would be able to show and auction the livestock they’d been raising for the occasion.) It’s a shame that the Biscuit Run land swap wasn’t able to include some land to establish permanent fairgrounds. The 8mm film was made by his father at the time of the capsule’s burial. The capsule’s location has been unclear, and the city has been eager to find out, so that it can be unearthed next year, for the city’s 250th anniversary. You are currently browsing the cvillenews.com weblog archives for the Entertainment category.